The entire universe is composed of matter. Stars, planets, people, atoms, everything in the universe is made up of matter. Anything that has mass and volume is composed of matter. Mass is defined of the amount of matter in an object. For example, a small pebble could have much more mass than a giant balloon because there is more matter tightly compacted in a pebble than there is in a blown up balloon. Matter and weight are sometimes confused but weight is the measure of gravitational pull on an object, whereas matter is constant in a perpetual form. Volume, on the other hand, is defined as the amount of space something occupies. So a blown up balloon will have more volume than a pebble even though the pebble has more mass. There are three main states of matter that we deal with most often: gas, liquid, and solid. The composition of each is based on how closely the molecules are to each other. The closest are solids. Liquid molecules are less compact than solids, and therefore are fluid. Gas molecules are the farthest apart and travel the fastest, and therefore they mostly can’t even be seen. These are the three main types of matter that we learn about throughout middle school and high school, and they are what make up almost all of our planet. It is possible to heat and cool elements to transform them into other states, such as freezing water (H2O) into ice cubes, temporarily making it a solid, but without constant cooling it will return to its natural state, as all matter does. Sign up for our newsletter HERE and you will receive a FREE print and online version of the best-selling astronomy study guide! 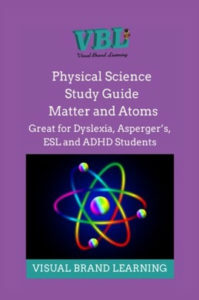 The Physical Science Matter and Atoms Study Guide is on sale for a limited time.